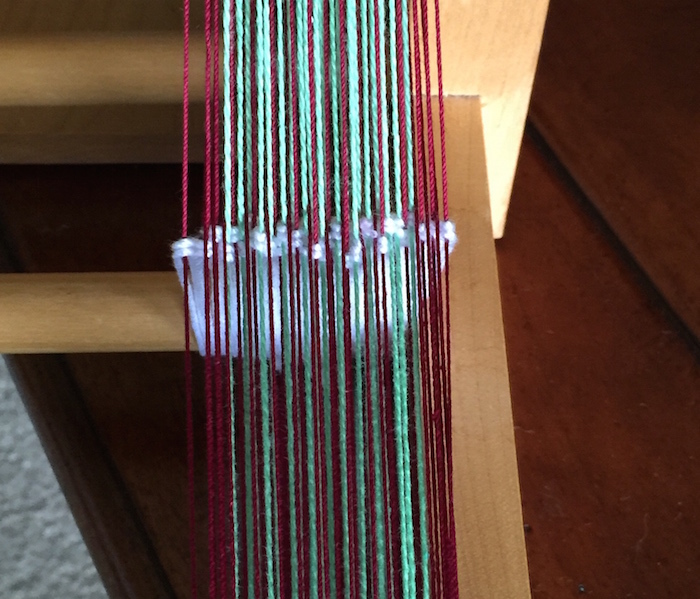 Ok I warped the Inkle Loom again. 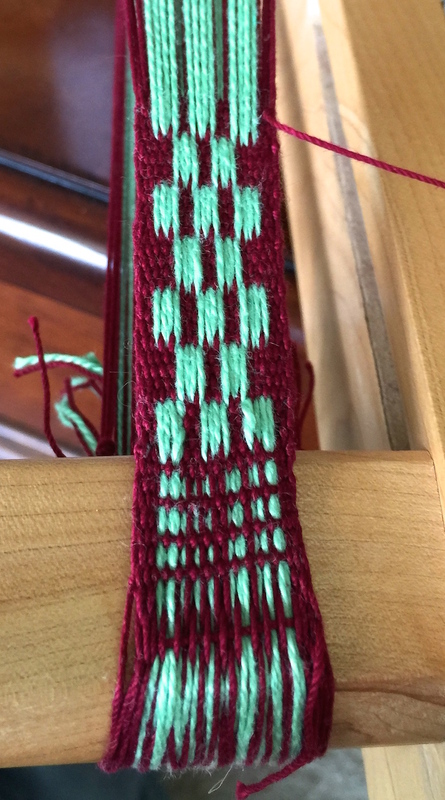 This time I strayed from the Baltic pages of the Inkle Pattern Directory and wandered over to the Monk’s Belt pages. Alas and alack, I started learning a bit from the get go. 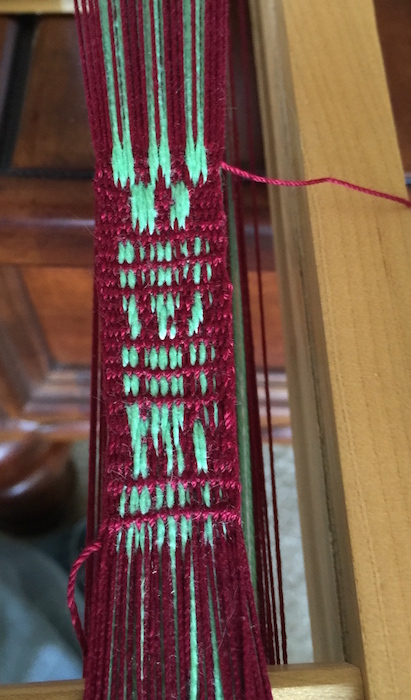 Though it looks like a pick up pattern again the warping of the loom was very different from anything I have done yet. If you look closely at the above picture, you will that there are three heddled warps together with one unheddled after. The burgundy here are a basic plain weave threading. each are every other one heddled and unheddled. But… and this is a big but. The green warps are all heddled. So this all means that three are heddled together. Hmmm… this was enough different to give me some antziness over how this was going to go. Yikes! not going well at all. just have to remind myself that when I started with Baltic those didn’t go well at first either. But all the same. This isn’t looking good at all. There is plain weave between parts that are suppose to be a flower. Hmmm… No flowers at all here. So what is wrong? Decided that the tension was a bit wonky so if we did something with that maybe there could be help. So I unwarped what you see and then cut sections and retied them on tighter and more even. So lets try this again. So with our new better tension and deciding to go with something simpler than the flower, we went to the first sample and started working. Ok I can see the pattern this time. I still don’t like it though. 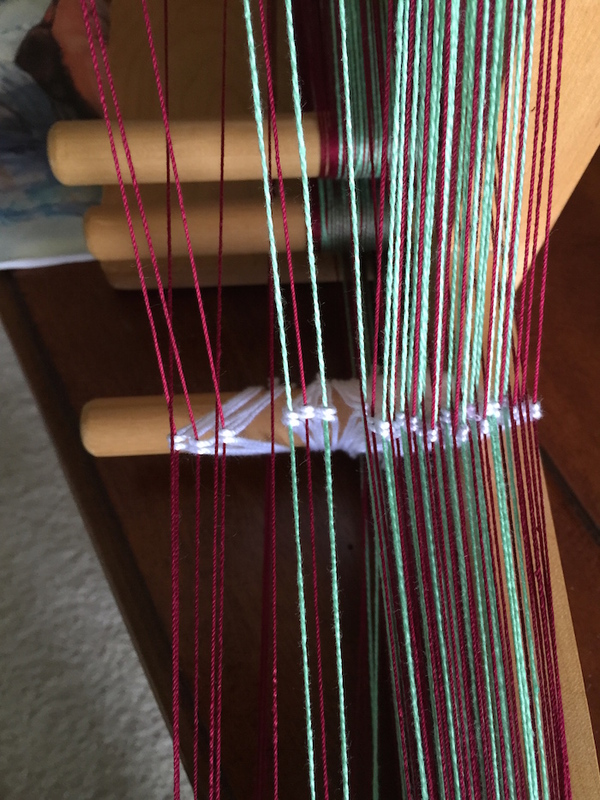 It does recommend that the pattern threads be quite a bit larger than the plain weave threads. Not sure that would really help. At least with my liking it. So the question is now will I finish this band? Not sure. I think I may just try different patterns down it and see how they look. Not as homogenous as all the previous bands but will not be wasting this warp. I had already discussed (with myself) throwing this warp away. Alas I love the colors. I hate wasting it all. So hence it still resides on the loom. I see a Baltic pattern in these colors in the very near future. Some of those patterns are a mystery to me. Glad to see you persevering when things do not go right. Good Luck!